"Our space is perfect for socialising"
On a warm summer’s day, Kerry and Rob Quayle love nothing more than relaxing in the garden, with daughter Darcie, or enjoying a glass of wine and dining alfresco with family and friends. However, this wasn’t always the case, as when they first moved into their Cheshire home, this sociable couple inherited nothing more than a badly rundown and unkempt plot. "The land had been used as a nursery for many years, so as well as being overgrown, it was littered with old sheds and greenhouse bases," recalls Kerry, "however, we had our hands full renovating the equally neglected house, so initially we simply opted to clear the rubbish and most of the planting, due to its age." The couple’s first addition was a large raised deck designed to rectify the problem of differing levels between house and garden, and also make the most of the afternoon sun and proximity to the kitchen. They chose tactile Scandinavian Redwood as it offered an affordable solution, plus the frame could simply be built over the existing ground. "It’s now the first port of call when entertaining, and also the perfect complement to our early evening sun patio – a re-purposed greenhouse base, adjacent to the house," says Kerry. In direct contract, the couple’s pretty garden room provides a welcome escape from the excesses of the sun’s rays and cooler evening breezes. "I’d always loved the idea of a summerhouse and as the bottom of the garden tends to be shaded by a large tree, it seemed the ideal place to construct a secluded shelter," says Kerry. The couple chose Rowlinson’s classic Kestel corner design to make the most of the available space and wisely invested in a sturdy concrete base, complete with damp membrane. Whilst a few coats of Cuprinol’s Garden Shades protects against the worst of winter weather. "We also employed a qualified electrician to relay an electrical supply, which ensures a well-stocked fridge for entertaining – plus the addition of a tv and wifi, has really helped make this an extra bonus room to our home," points out Rob. The couple are also pleased to report that it’s the ideal spot to watch the sun go down on summer evenings. "Although I’m sure if you asked Darcie, she’d say that it’s her very own, personal playhouse!" smiles Kerry. 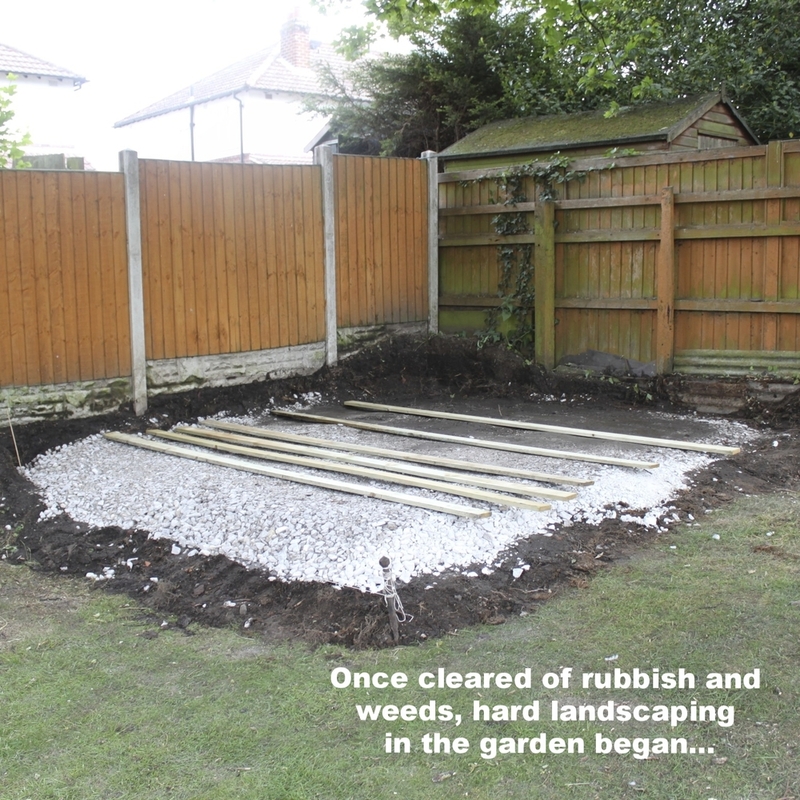 Despite having previously enlarged the existing borders and re-turfed strategic areas, the actual garden design didn’t really emerge until the hard landscaping had been decided. "We opted to keep the existing central path as it naturally linked the top patio areas with the new summerhouse and original brick store," explains Kerry. However the large beds were then gently curved to add definition and help soften the space, before being filled with a mix of heathers, roses, rhododendrons, hydrangeas, hebes and acers. Kerry also points to the layer of blue slate chippings that help reduce weeds and retain moisture. While a paler, light-enhancing, practical gravel was used around the summerhouse and for the surrounding shady undulating ground. To ensure interest and shape throughout the year, the couple also planted plenty of structural evergreens and introduced statement garden ornaments, alongside recycled furniture pieces, painted to match the new garden room. Whilst a homemade trellis arch, entwined with Wisteria, adds welcome height to the pathway, now generously lined with Kerry’s favourite lavenders – and which also take centre stage in versatile, and easily refreshed, patio pots. However, Kerry readily admits that her favourite feature has to be the summerhouse. "I love how it offers a totally different perspective on the garden, and my only real regret is we didn’t insulate it for winter use!" "Tiers transformed our dull 80s plot"
Laura Green’s garden is so contemporary that it’s hard to believe that only two years ago, it looked like a throwback to the 1980s. "My modern garden is pretty, not stark"
When Kelly moved in to her house two years ago, the garden was characterless and bare. She wanted an easy-to-care-for garden she could enjoy all year round, so she set about transforming her unloved plot. 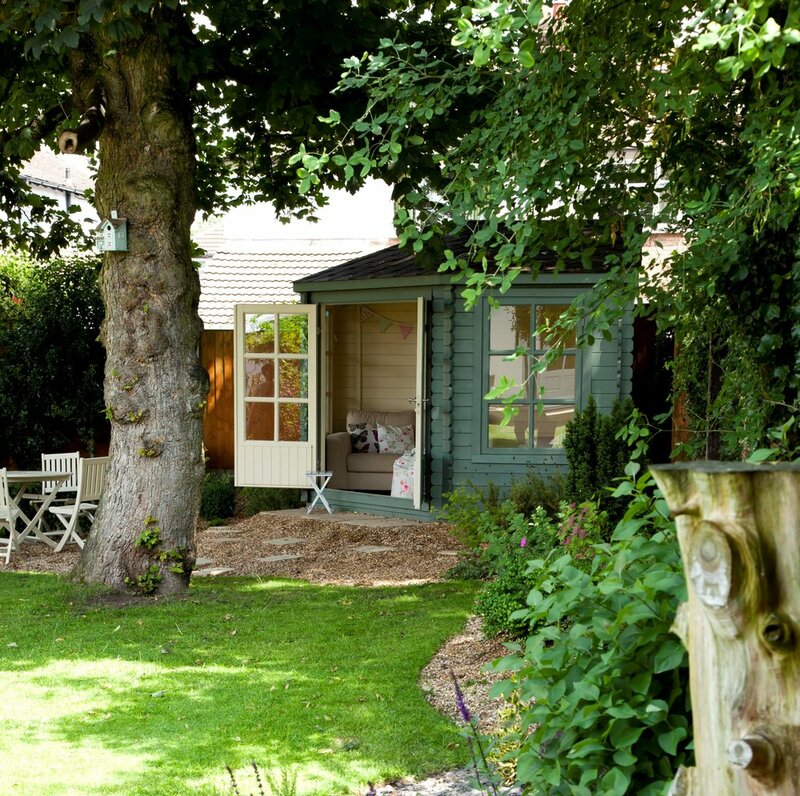 Transform your shed into a garden haven! Once seen as a functional space to stash the mower, garden sheds are having a fashionable moment. Reader Gill Lockhart turned the tumbledown workshop at the bottom of her garden into the perfect space for crafting. Colm Sheppard transformed his small Cambridgeshire garden in 121 hours, at a cost of just £1,723. When he moved in eight years ago, it was just a scruffy patch of grass surrounded by boring fences. Make your garden look twice its size! Dawn and Mike Fletcher turned their garden from scrubby lawn and tumbledown shed to the prettiest garden packed with clever and achievable ideas. Painted fences have been increasing in popularity for a number of years, but it’s only recently that there’s been a move towards using dark, bolder shades outside.